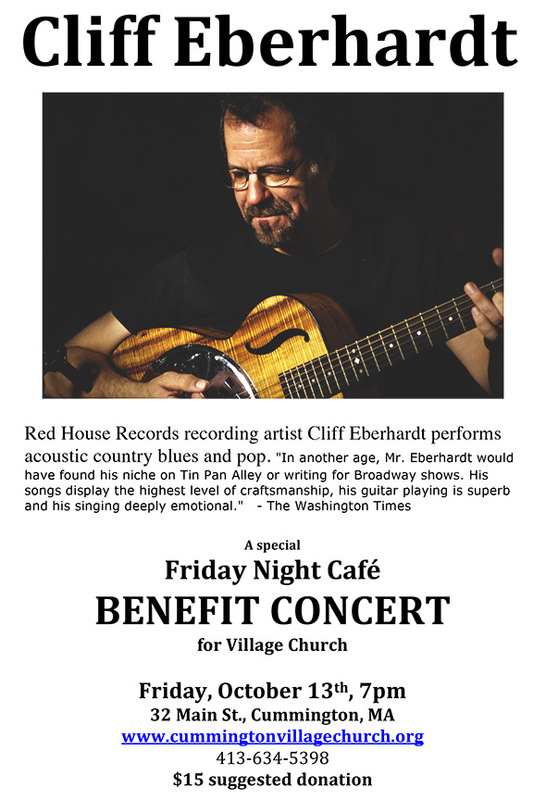 Our benefit preformance by Red house Records recording artist Cliff Eberhardt was a great success with over 60 people attending. 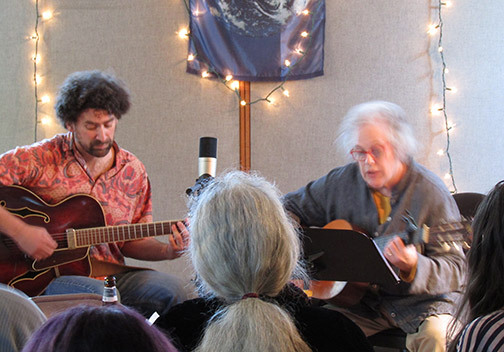 He was joined in several numbers by award-winning singer Louise Mosrie, to the crowd's delight. 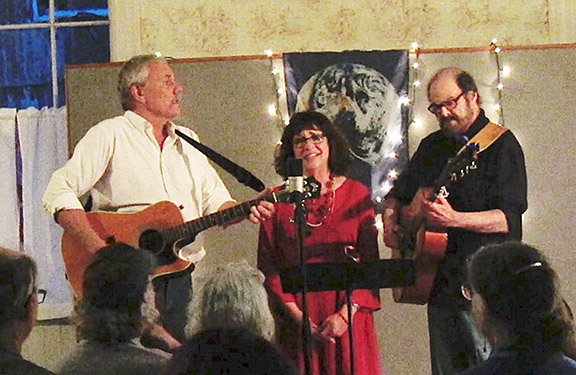 The Village Church gives its warmest thanks for this benefit performance! 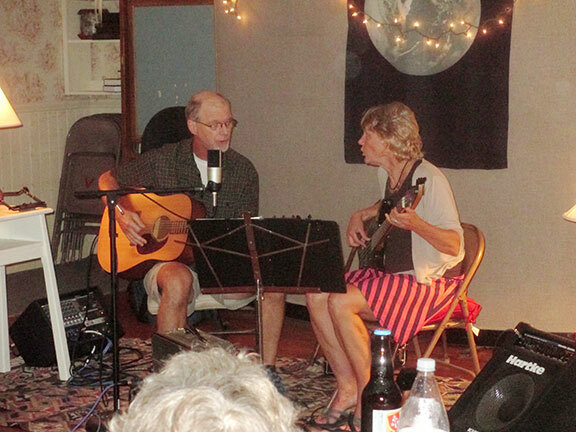 Cliff and Louise Mosrie singing. 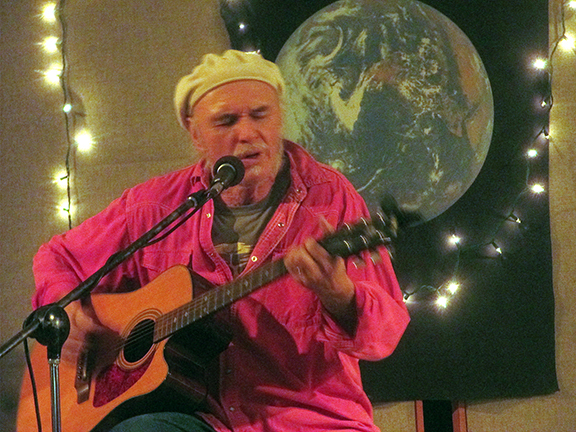 Special show on October 13! 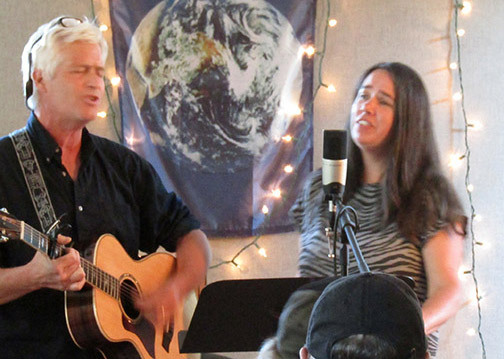 The Café returned on September 8, 2017 with a great show from Radio Free Earth—Kim and Josh Wachtel. 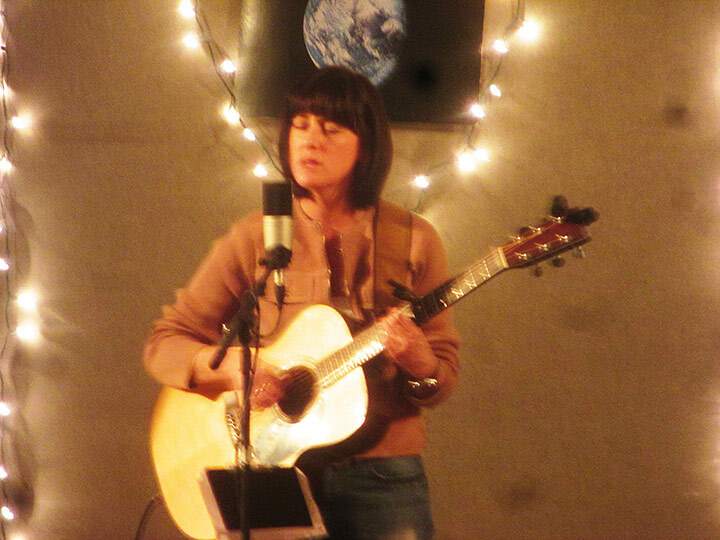 So good to have the music back! 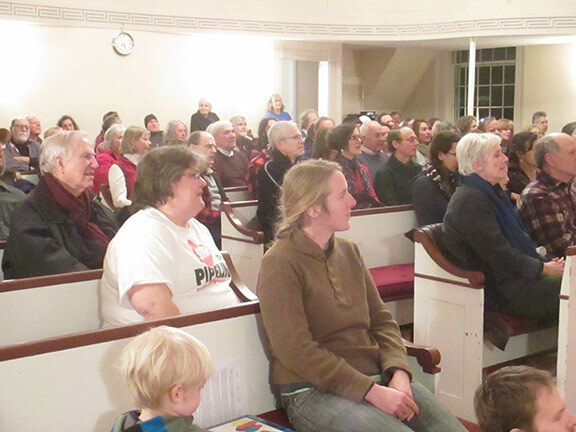 On this evening we also had the drawing for the beautiful quilt which was raffled off in support of the church. 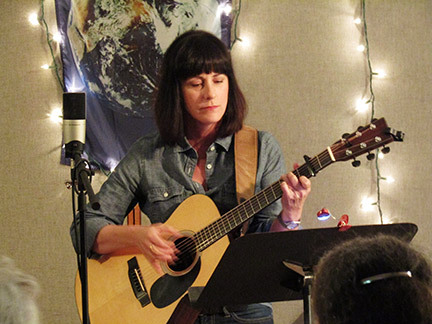 The winner was Darlene Graham! 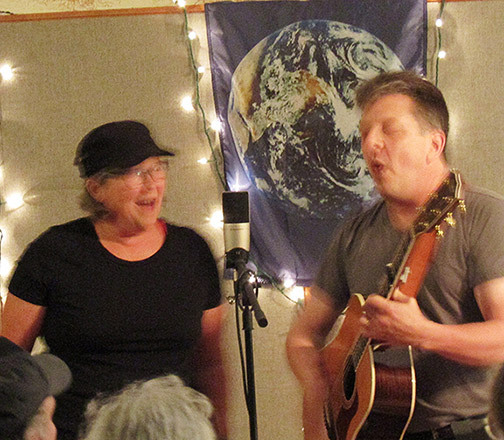 Kim and Josh Wachtel—Radio Free Earth—singing for the enthusiastic crowd on September 8, 2017. 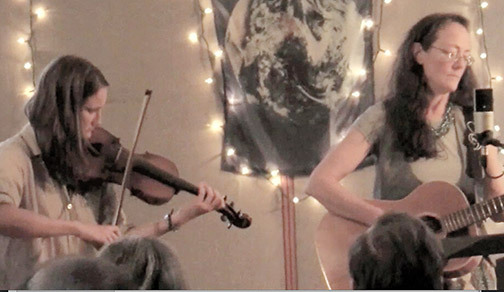 The last night of the 2016-17 season, the Newport Folk Night—June 9th, was a big event—celebrating the 50th anniversary of the 1967 Newport Folk Festival. 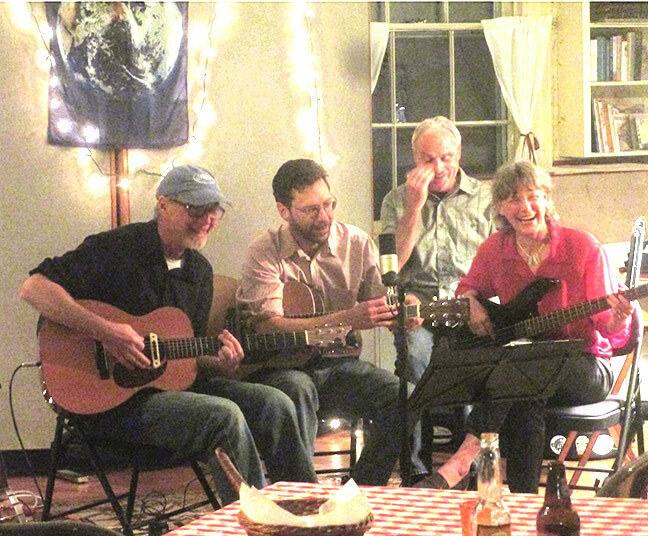 Many musicians showed up to play music from the festival or sung by artists who were there. 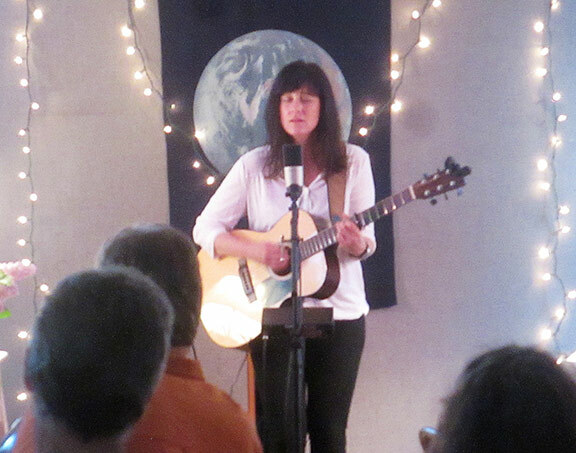 The audience of 60 or more people sang along to many familiar tunes. 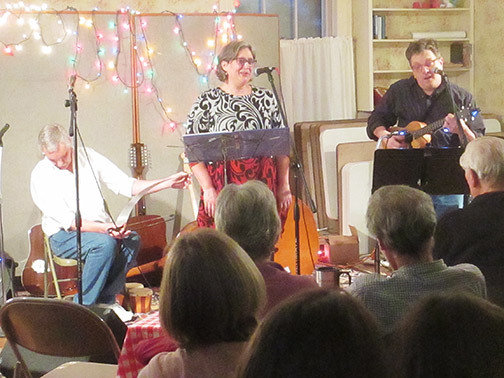 It was a great ending to a successful season.Following are some photos and links to music from that night, and other nights as well. 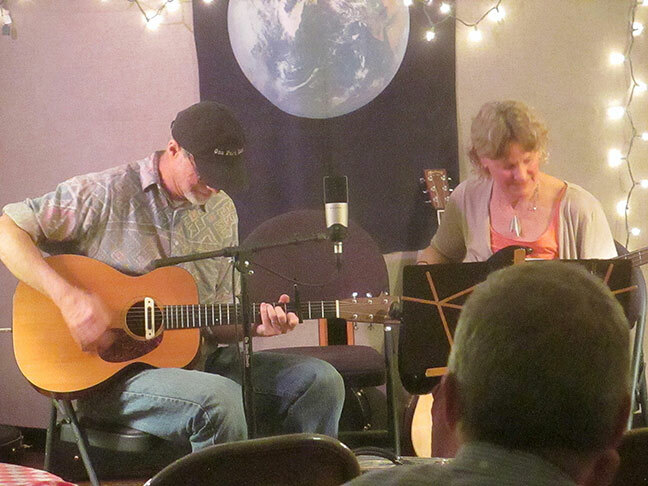 Keith Orcutt and Peg Cowen. 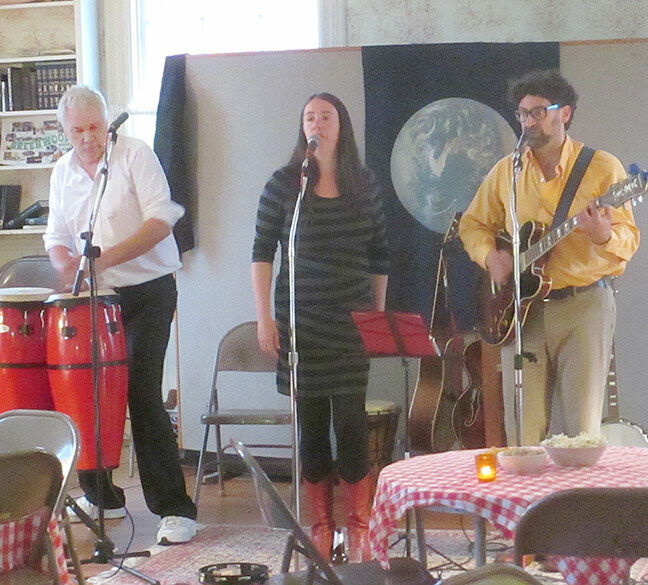 and Chris Haynes, right, on accordian. 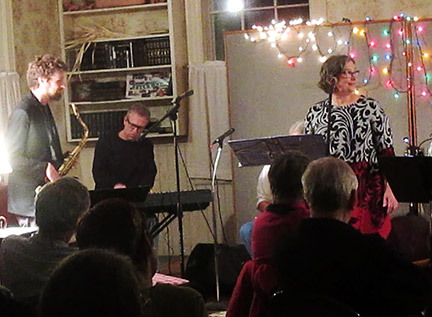 Benny Kohn, piano; Dave Christopolis, bass; Laura Pierce, vocals; and Michael Kolodny, sax. 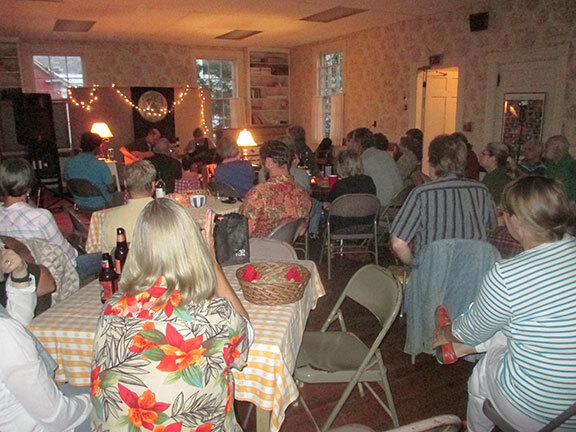 crowd that night—people enjoying themselves. 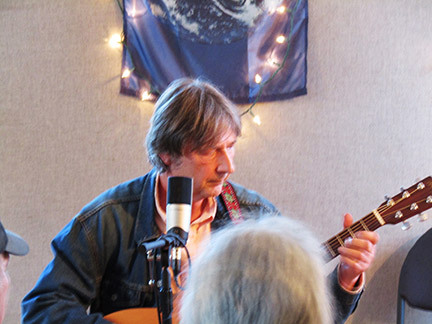 on the left, and Wayne Higgins on the right. 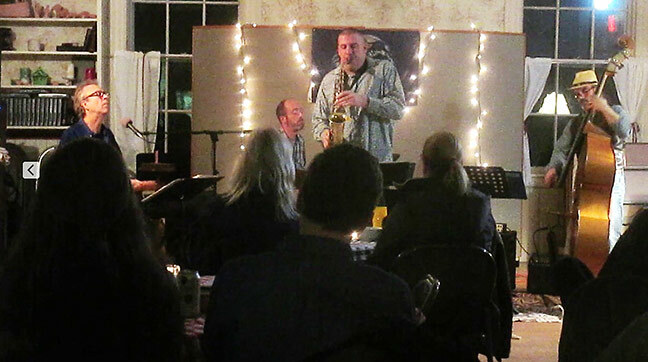 sax and Dave Christopolis on bass. 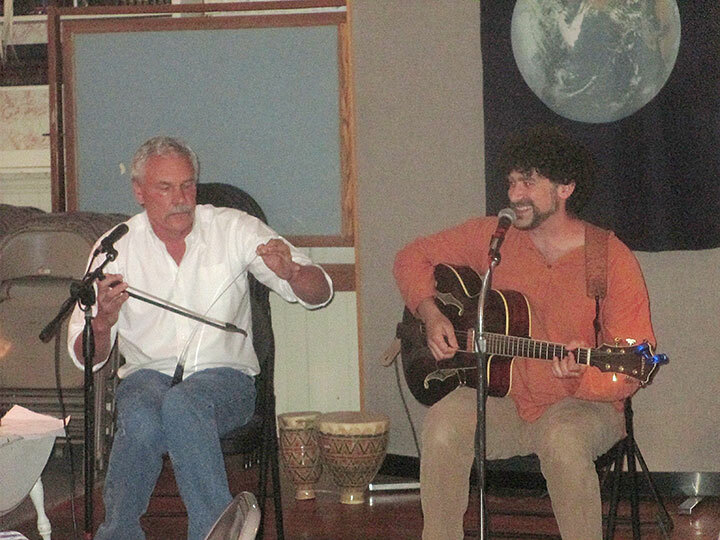 Jim Armenti and Ray Mason, AKA The Lonesome Brothers, appeared on February 10. 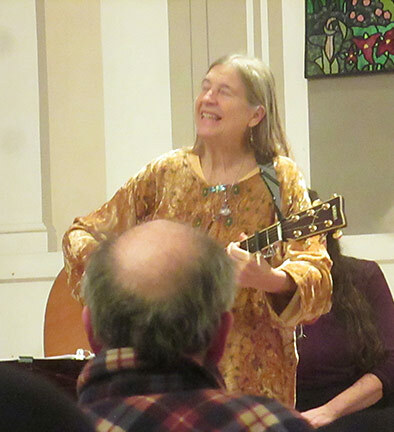 Louise Mosrie came to us on January 27, 2017. 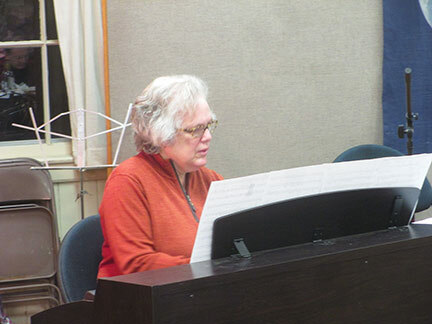 Rachel Laitman returned to the FNC on January13th. 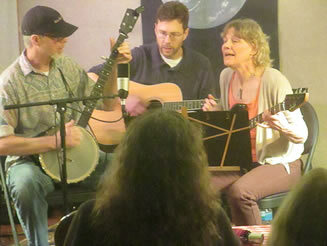 She was accompanied by Sean Kimball on base. 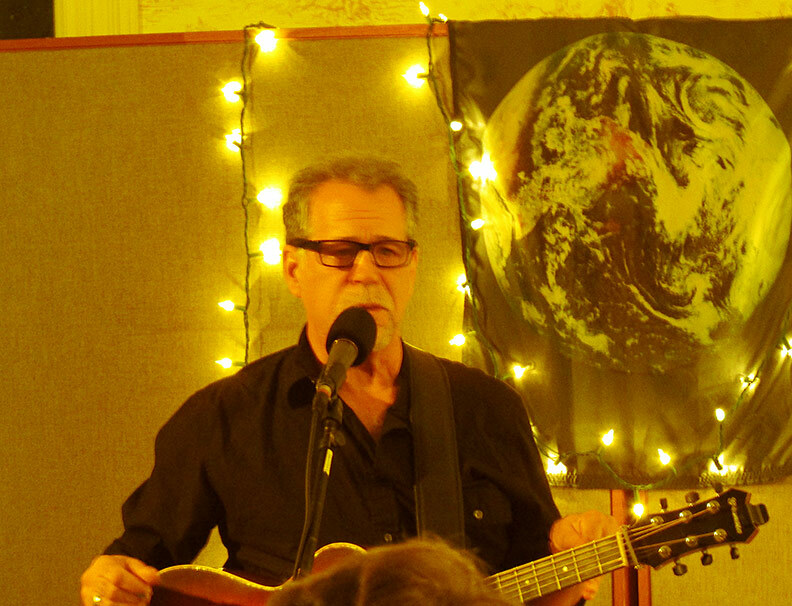 Jim Kaminsky appeared on December 9, 2016, with his soulful blues. 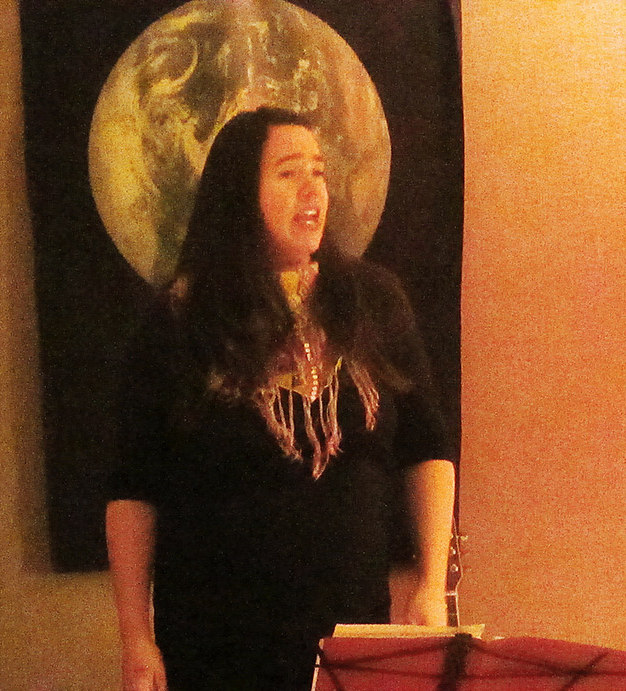 On November 25th we were treated to the lovely voice and instrumentals of Norma Jean Haynes. 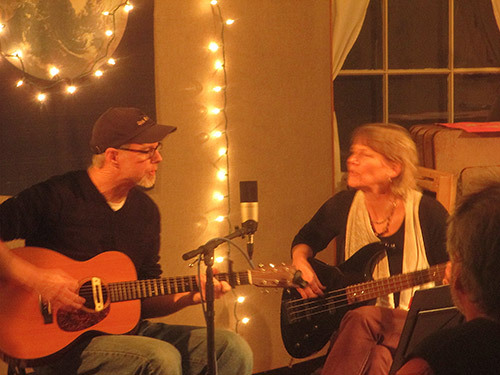 On November 11, the Friday night jam people came and played their music in the first half of the show, and One part Luck, Peg Cowen and John Bye played the second half. 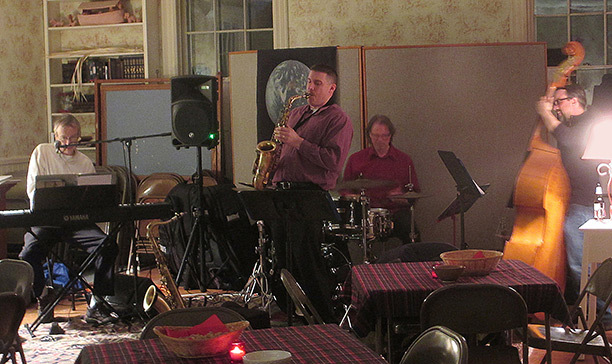 Members of the Third Friday Jam Session played the Café on November 11th. One Part Luck finished the evening. 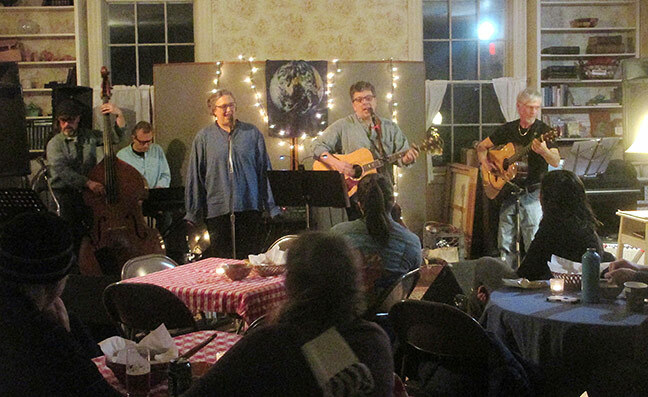 The Café opened the 2016-17 season by putting on "Fuller's Follies," the annual fundraiser for the Food Pantry. 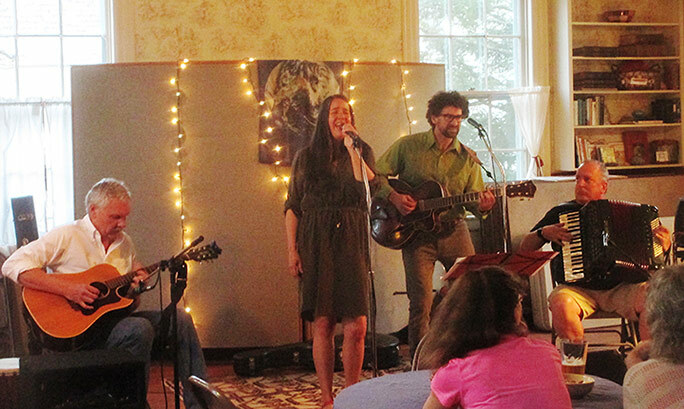 On June 10th there was a 50-year anniversary celebration of Simon and Garfunkel—the "Sounds of Silence" tribute. 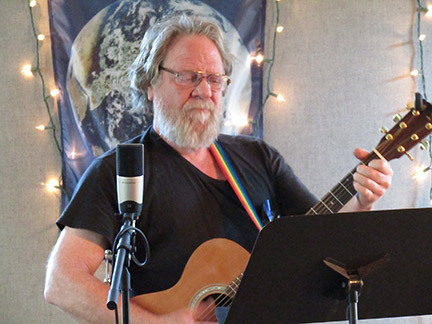 Musical guests include John Bye and Peg Cowen, Josh and Kim Wachtel, Rachel Laitman, Sean Kimball and Heather Cupo, James Kitchen and Mike Metger, Daniel Plane and Tatiana Berendi, Jonathan Rehmus and Michael Jennings. 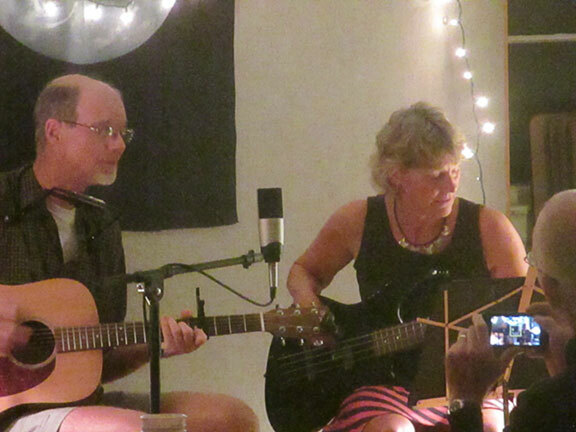 Left: James Kitchen, Kim Wachtel and Josh Wachtel. 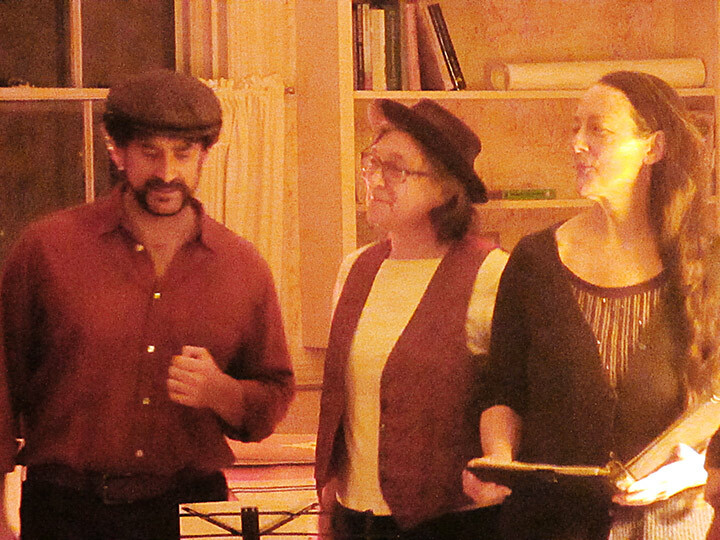 Right: The audieance and performers. 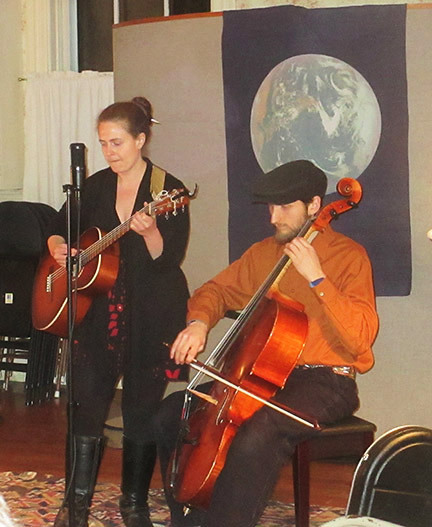 Radio Free Earth played at the Café on April 22. 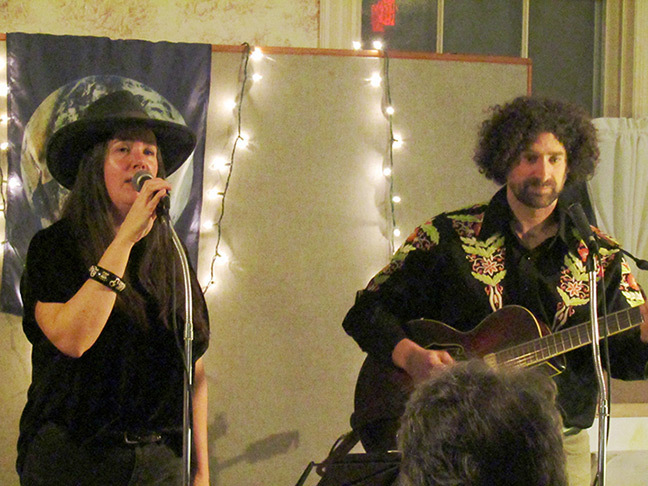 Kim and Josh Wachtel were joined by ubiquitous sideman James Kitchen (he's been playing with almost everybdy lately—and we love him) on drums, saw and harmonica. 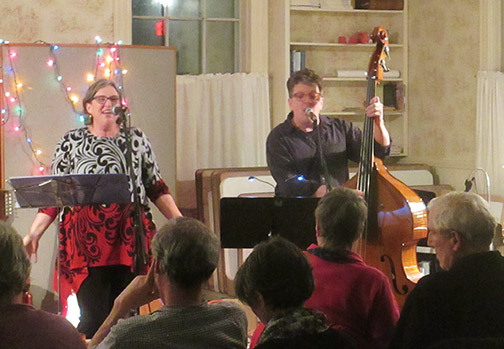 RFE's crossover repertoire delighted the crowd. Dancing occurred. 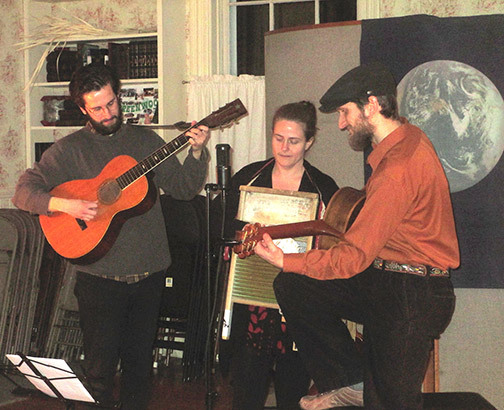 Below: James Kitchen, KimWachtel, Josh Wachtel. James Kitchen on the saw. 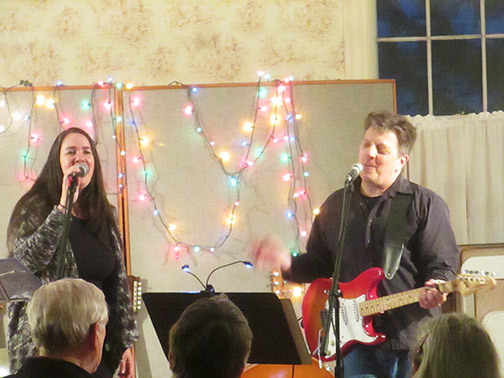 On April 8, Guilty Pleasures—Heather Cupo and Sean Kimball—appeared at the Café and brought some friends along to play on a few songs. 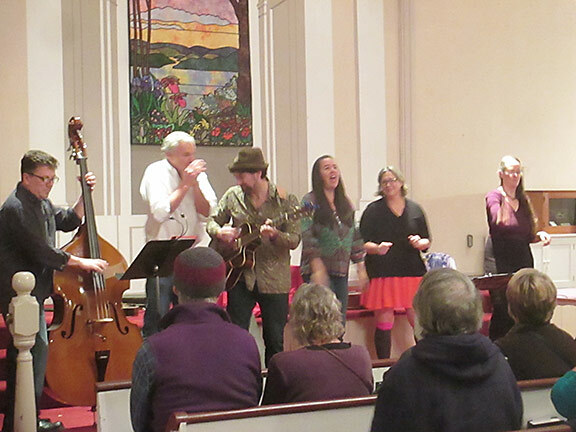 Dave Bartley, piano, James Kitchen, singing saw and harmonica, Kim Wachtel, vocal, and Dan Friedman on sax joined in at various times. 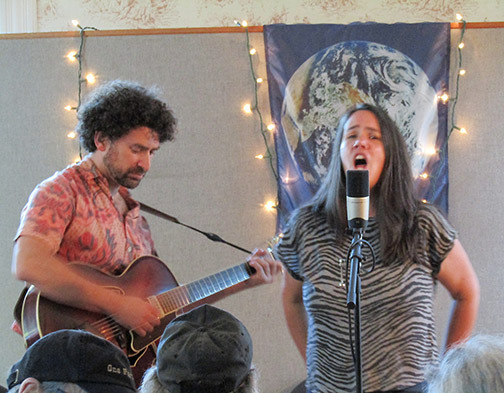 It was a capacity crowd and Heather and Sean had folks up on their feet a couple of times. 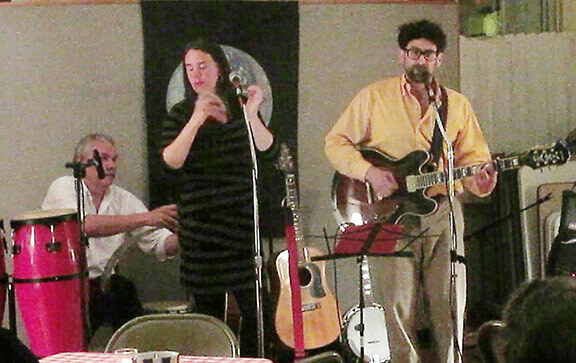 Dave Bartley solos on piano while Dan and Heather listen. 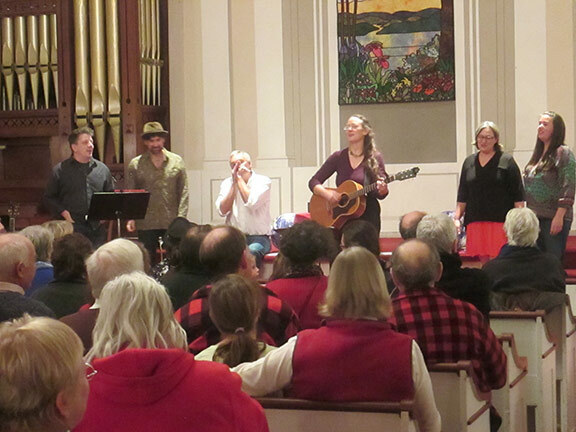 Right: Folks on their feet for a rousing tune. 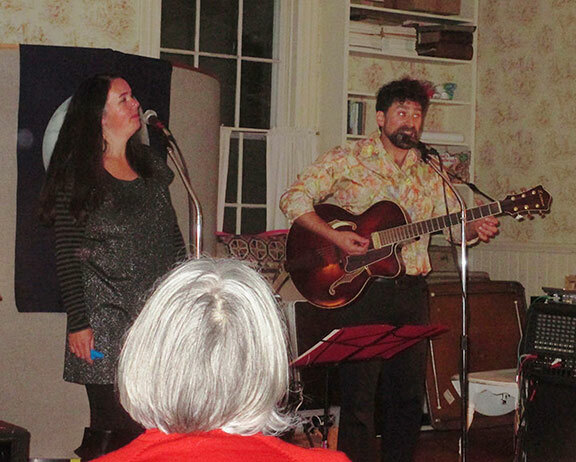 Heather and Sean belt it out.Right: Kim joined in on a bluesy number. 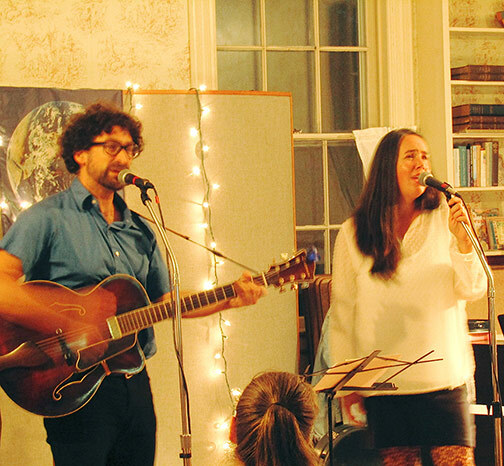 Dan Friedman, Heather Cupo and San Kimball. 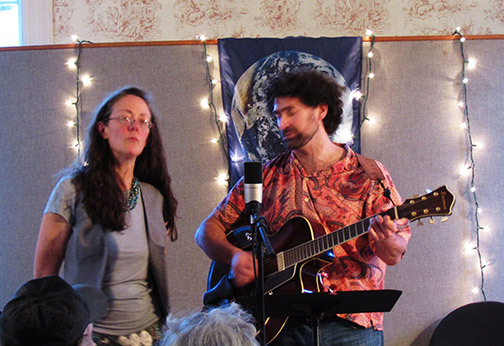 Right: James Kitchen on saw joined Heather and Sean. 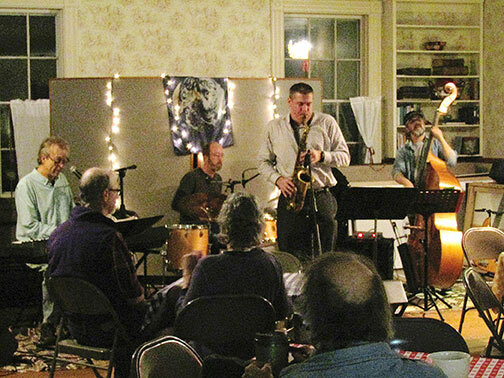 In March Dave Bartley was back with "Blue Jazz," with bandmates Aaron Dean, Fran Curley, and Dave Christoplis on the 11th. 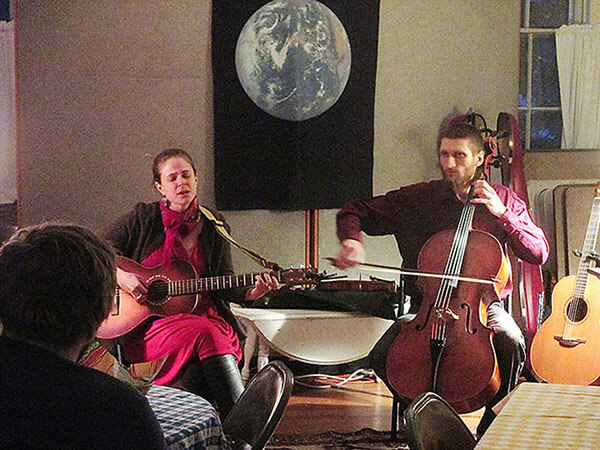 On the 25th the husband and wife team of Tatiana Berendei and Daniel Plane, playing as "Viatsa," were back with their collection of folk, blues and original songs. 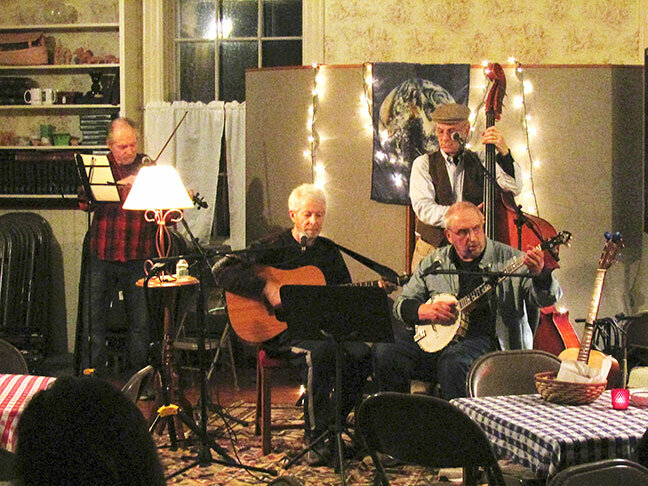 They were joined for the first set by Max Wareham of the bluegrass band "Morning Bugle." 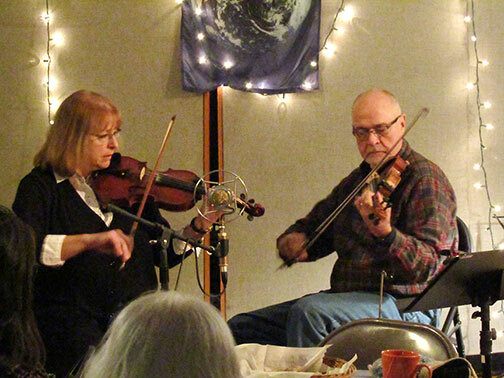 On Friday February 27, Laurie Israel and David Perkins returned with a collection Of instrumentals and songs ranging from Edvard Grieg to Rodgers and Hammerstein with Appalachian ballads in between. 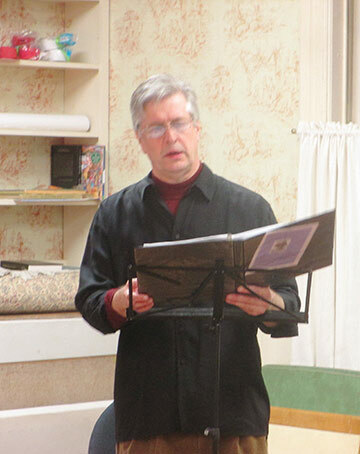 There were folk songs, and show tunes, songs tragic and songs funny. 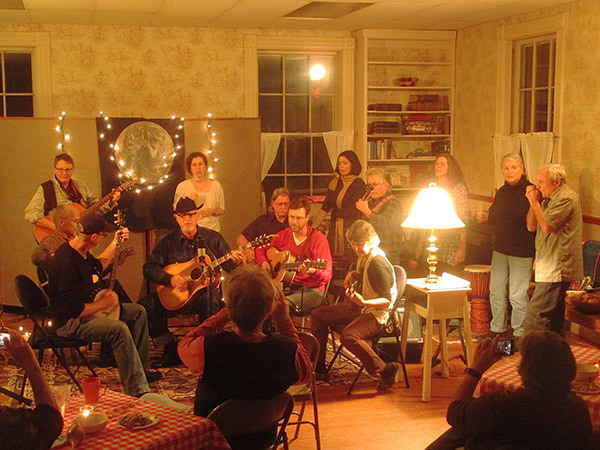 Over thirty people were there to enjoy it all. 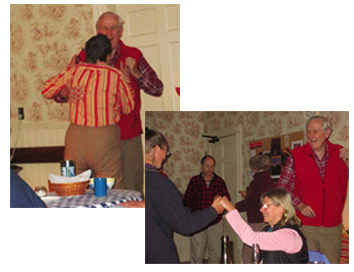 The Valentine's Dance on Saturday February 12 was a big success, even tho the crowd was a little smaller due to the frigid temperatures and wind chill. 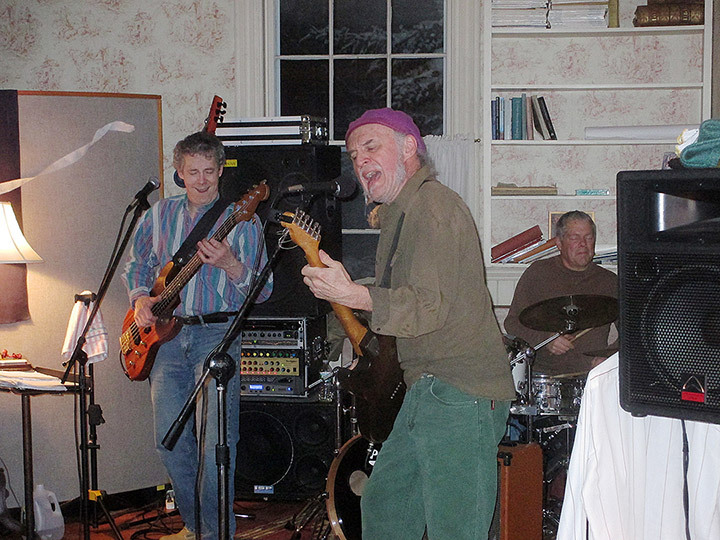 Jim Kaminsky was back again with his bandmates Rudi Weeks on drums and Bill McManus on guitar. 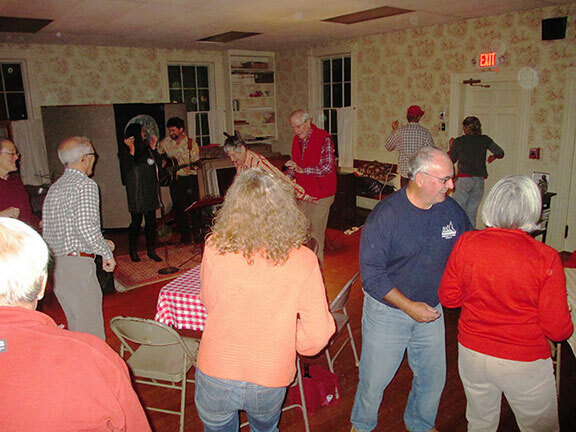 Their rocking blues really got people dancing. 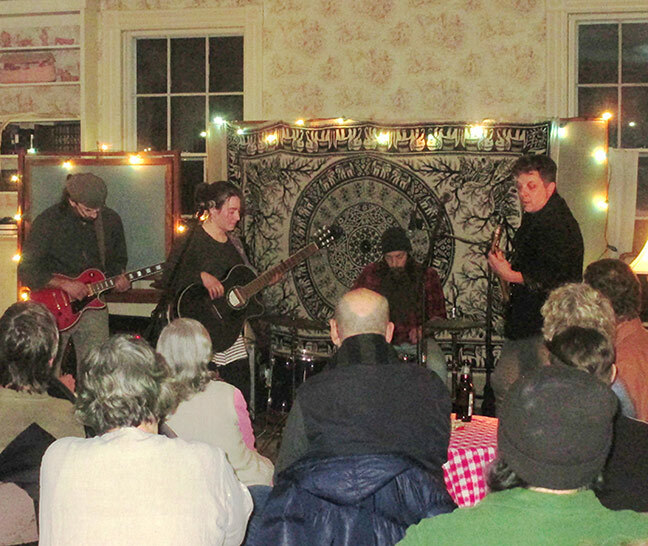 It was just what was needed for a cold February night. 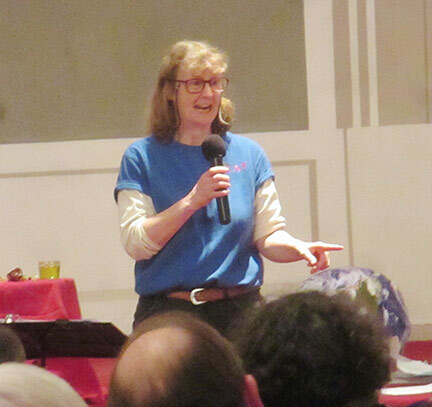 On Friday, January 22, a large crowd of over sixty people gathered to hear Rachel Laitman and her Fine Young Men. 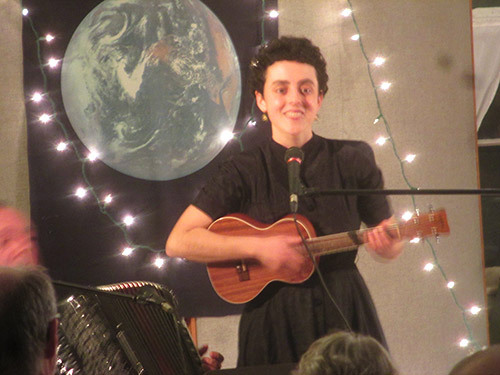 They are all accomplished musicians and Rachel has a low and pleasant voice which she uses well. 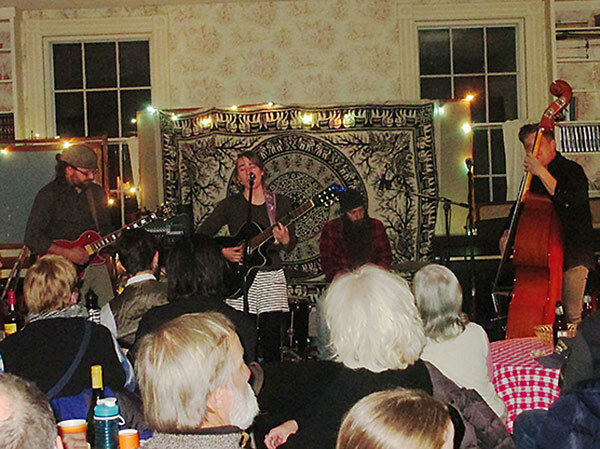 Her "Fine Young Men" are Sean Kimball on bass, Jay Cole on drums, and Jason Szafranski on guitar. 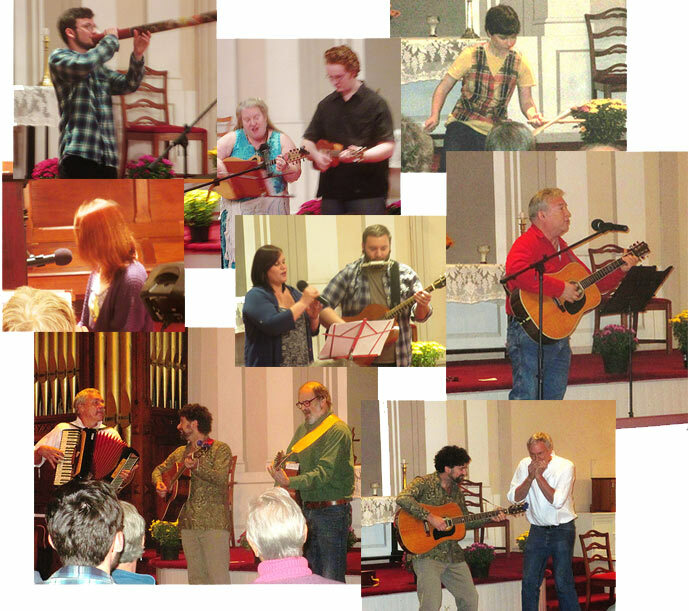 We have a great group of musical talents here in the Hilltowns. 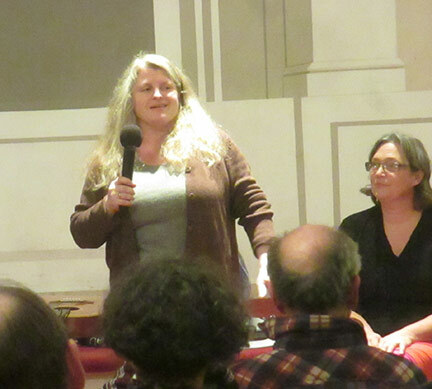 On January 8, 2016, The Friday Night Café took over the church sanctuary for an evening of music and information about the efforts to stop the Kinder Morgan pipeline through Massachusetts. 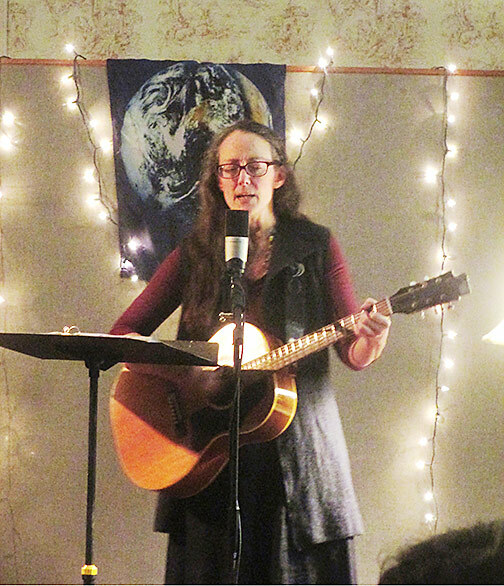 Sarah Stockwell-Arthen organized the event, as it was her night to perform at the Café. 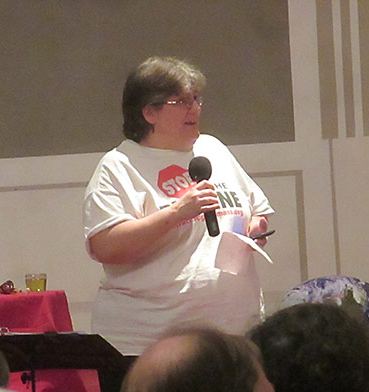 Rosemary Wessel of No Fracked Gas in Mass (nofrackedgasinmass.org) spoke about how we are all affected by the pipeine, Katy Eiseman of the Pipe Line Awareness Network for the Northeast, PLAN-NE, (plan-ne.org) spoke of her organization's work, and Jane Wynn of the Berkshire Environmental Action Team, BEAT, (thebeatnews.org) also spoke of efforts to stop the pipeline. 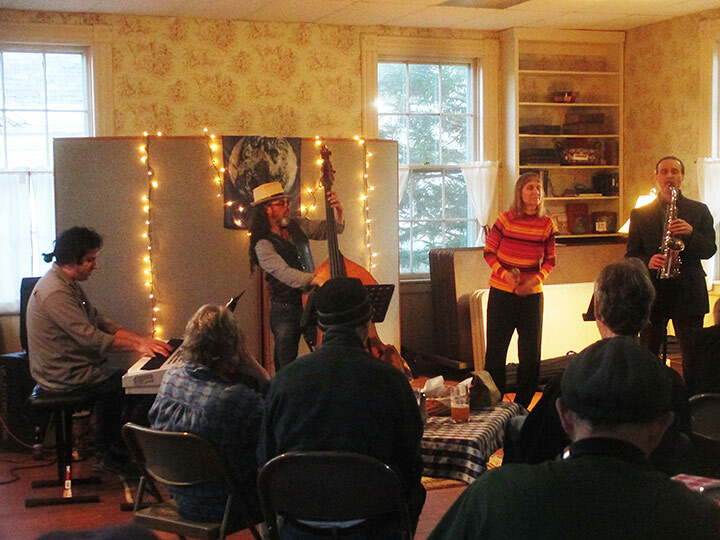 The music was splendid. 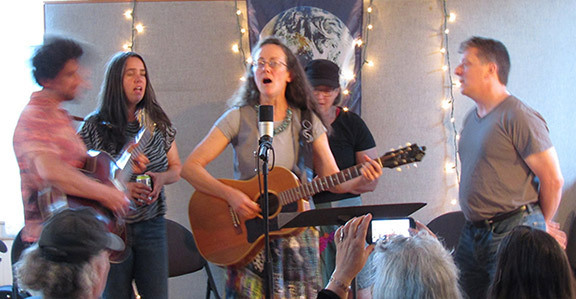 The musician lineup, besides Sarah Stockwell-Arthen, included Kim and Josh Wachtel, Heather Cupo, Sean Kimball, and James Kitchen. 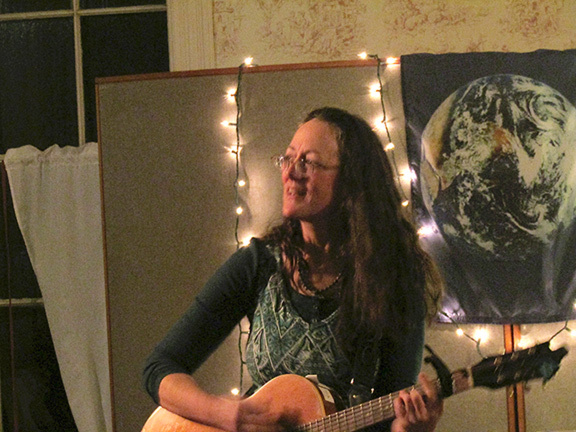 Sarah Pirtle also made a solo appearance. 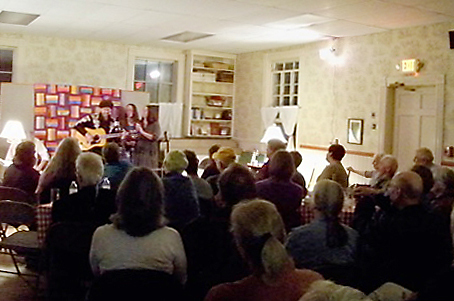 Over ninety-five people came to hear and sing along and donate to the cause. 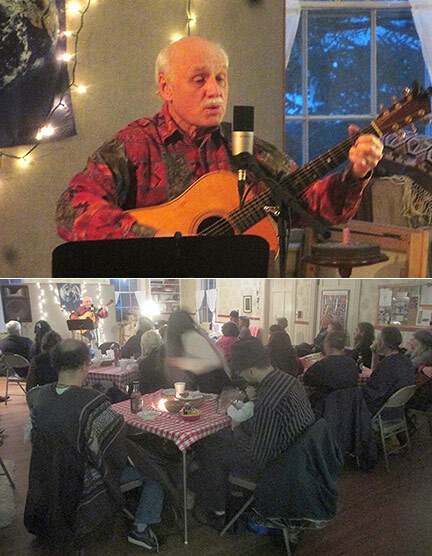 On December 11, Viatsa couldn't come, but Jim Kaminski ably filled in the evening with his original bluesy tunes. 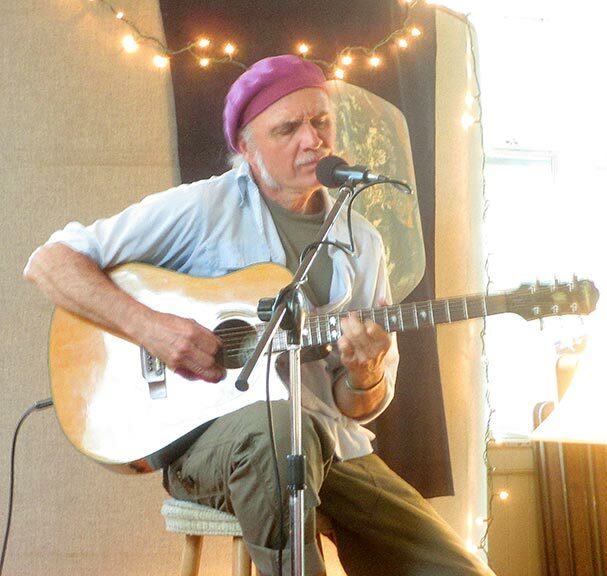 His songs were great and his guitar playing excellent. 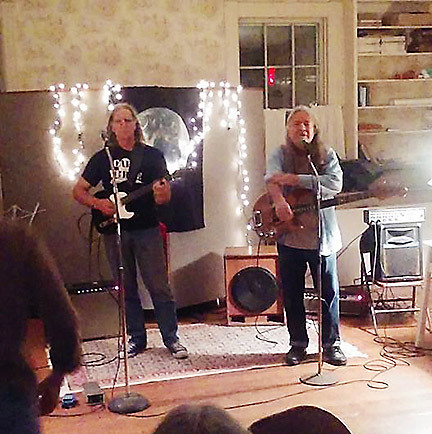 On the 27th of november, the legendary Lonesome Brothers (Jim Armenti and Ray Mason) came for a post-Thanksgiving performance at the Friday Night Café and rocked and rolled the night away. 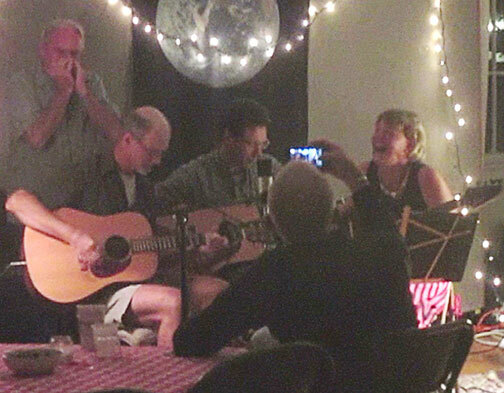 November's Friday the 13th, 2015, turned out to be a lucky night for the Café patrons. 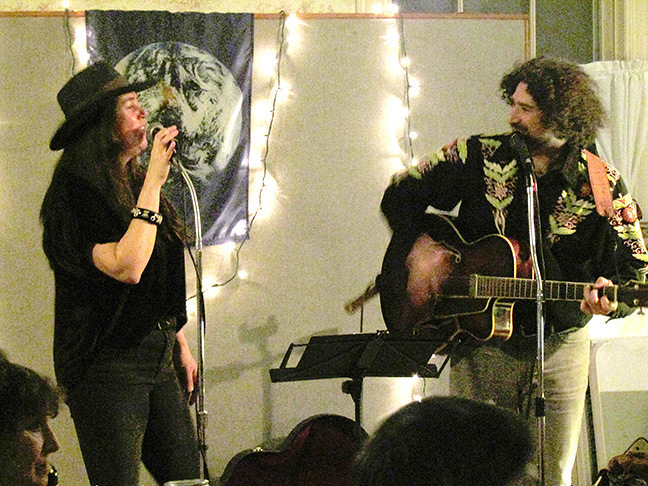 Radio Free Earth (Kim and Josh Wachtel) gave us a smokin' set of blues and rock. 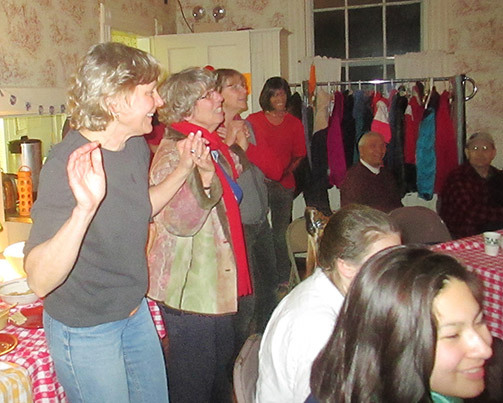 The evening ended with the crowd on its feet dancing. Sometimes it just takes two to get it started. Then a couple more join in. Next thing you know, everyone is on their feet. 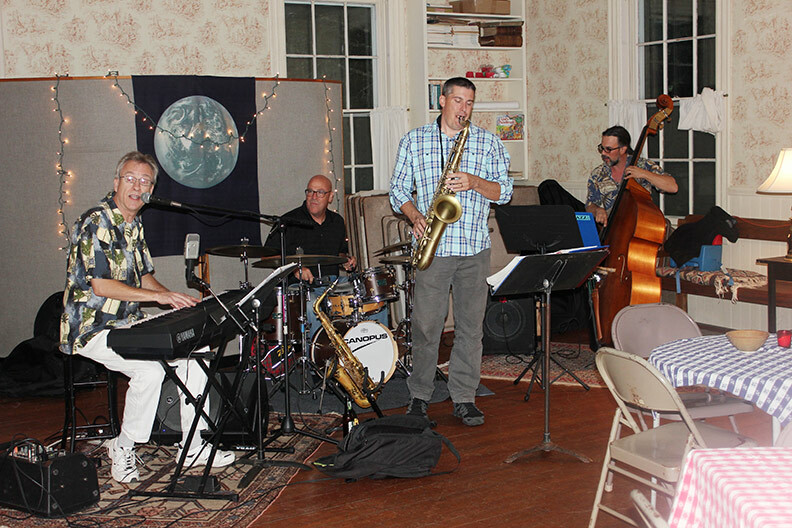 On September 25, Dave Bartley and his group entertained the Friday night crowd with some cool blues and jazz. 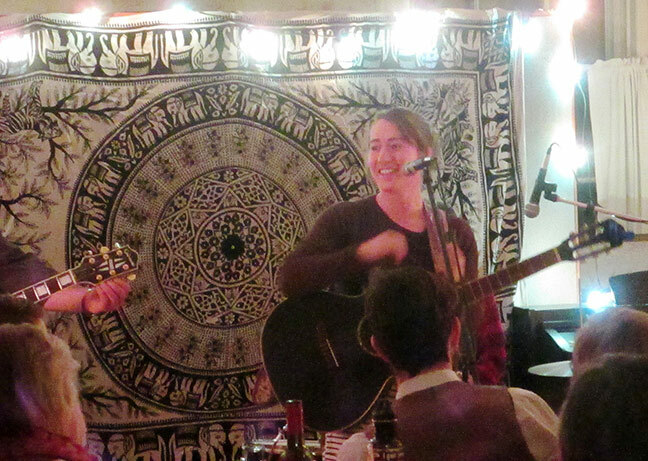 These guys put on a splendid show. 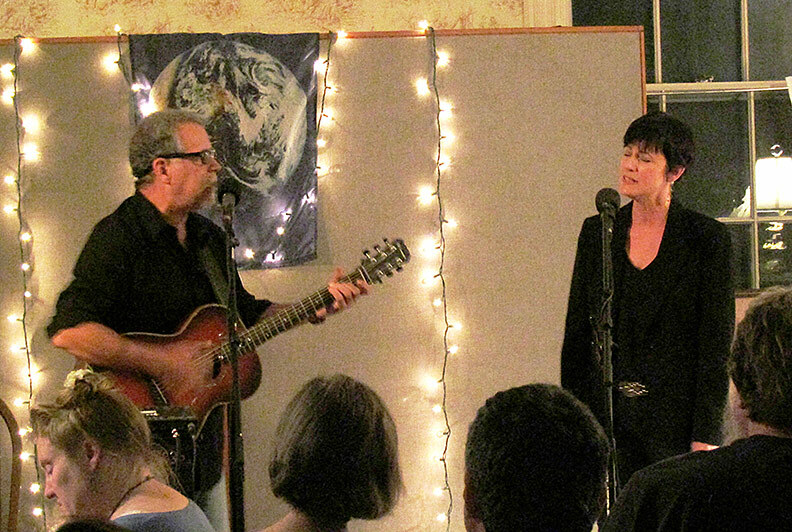 John Bye and Peg Cowen—One Part Luck—filled the room with one of the biggest crowds ever at their CD release party on September 11. 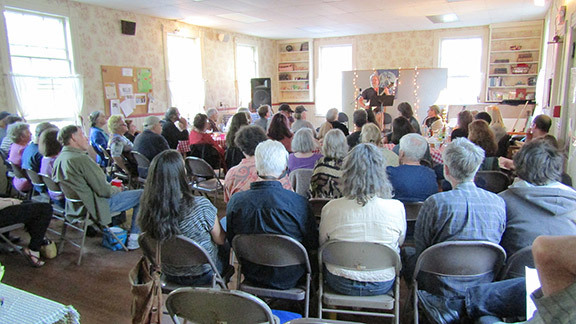 So many friends came out to support them, and they deserved it! 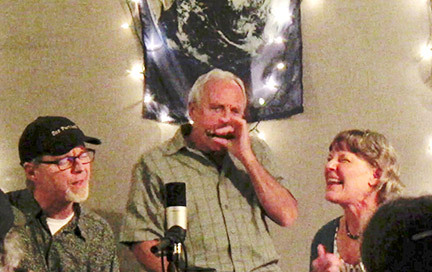 They were joined in some numbers by friends Keith Orcutt on harmonica and Nate Treloar on guitar. 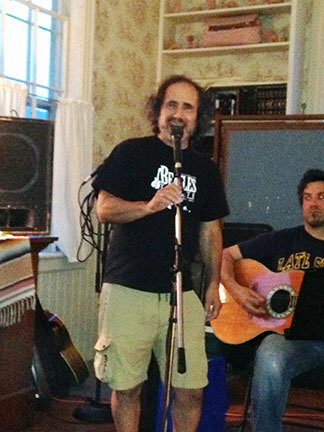 On June 12 there was a rousing celebration of the 50th anniversary of the ground-breaking Beatles album, Rubber Soul. 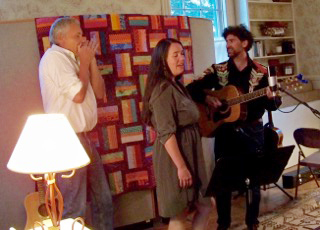 And on June 26 Josh Wachtel finished off the 2014-2015 season in a solo show with some help from James Kitchen on harmonica and magical musical saw. 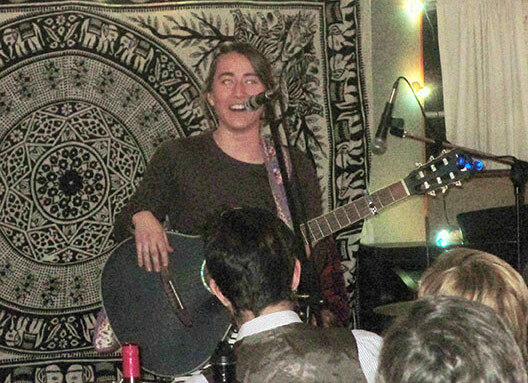 Happy Beatles music crooner. 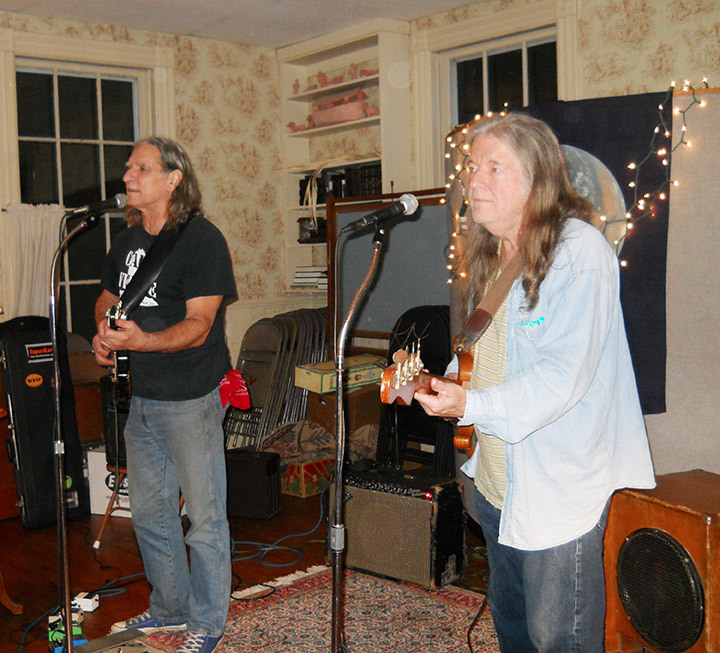 James Kitchen on saw and Josh Wachtel on guitar. 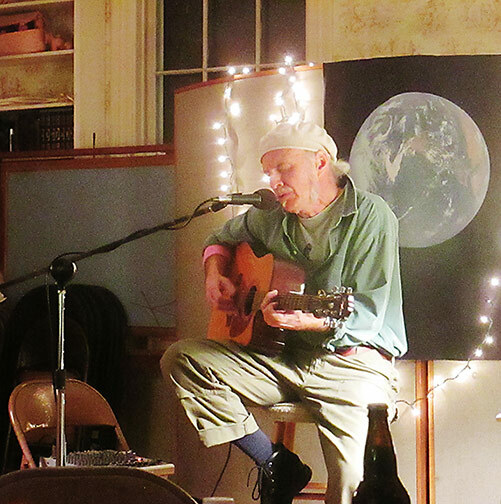 On May 8, Jim Kaminski played a solo show for his fans. 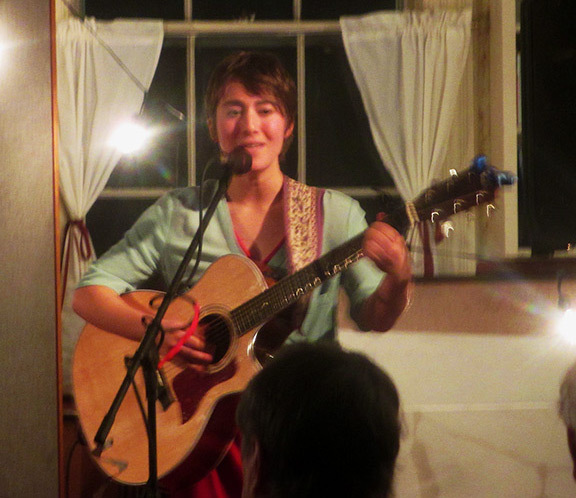 And on May 22, Jack Swindlehurst performed. 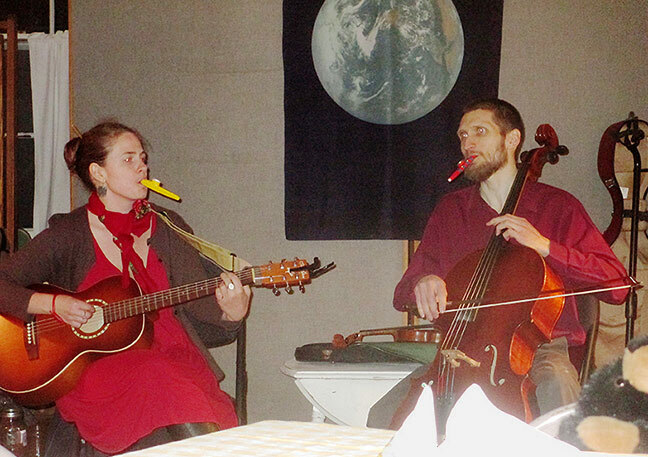 On April 24, Viatsa, Tatiana Berindei and Daniel Plane, delighted the crowd with their quirky folk music styling. 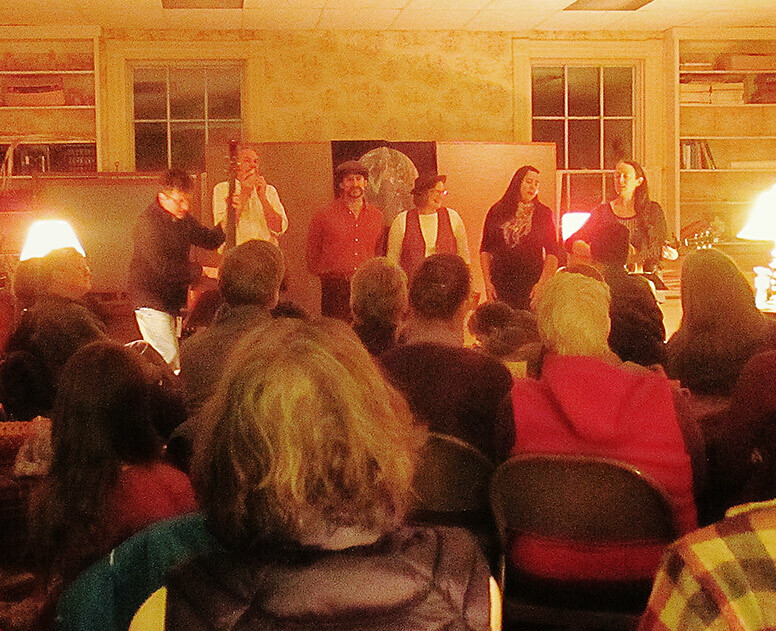 The crowd also happily sang along withthe old song "Sixteen Tons." 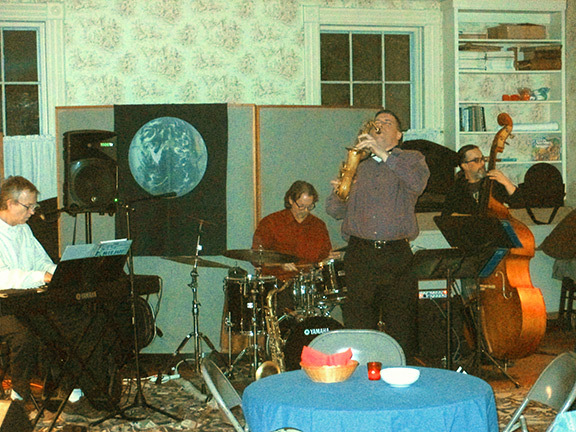 Kelley on drums to give us an evening of very good jazz. A nice way to warm up a winter's night! 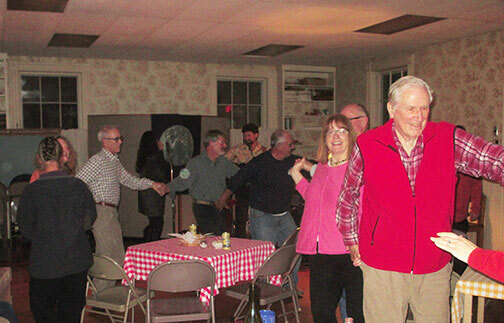 The Valentine's benefit Dance was another big success! 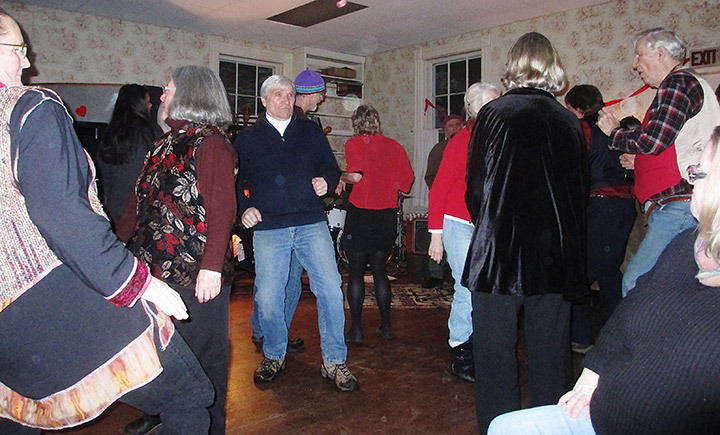 In spite of crummy weather a big crowd showed up to boogie the night away. 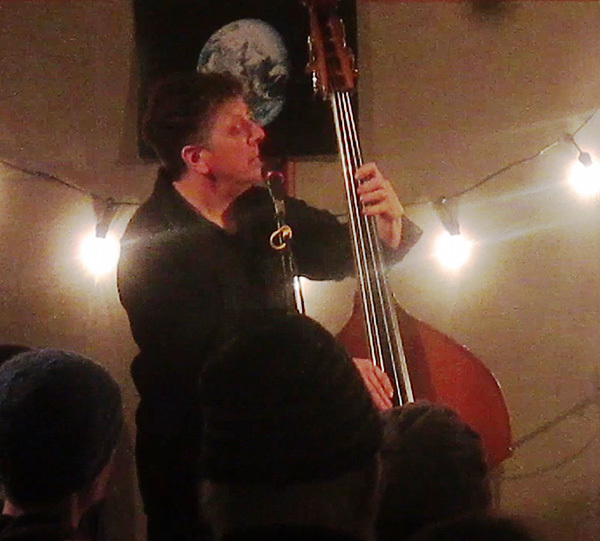 Jim K and Co. were terrific! 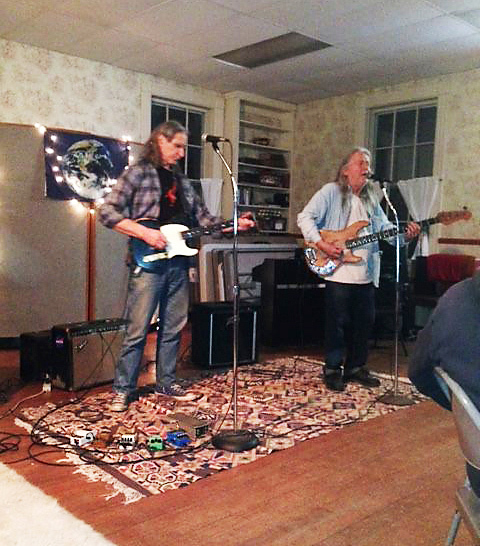 Lilac Wine, with Guest James Kitchen, appeared on January 9, 2015, and rocked a full house of 60 people with theri mix of blues, rock, and folk. 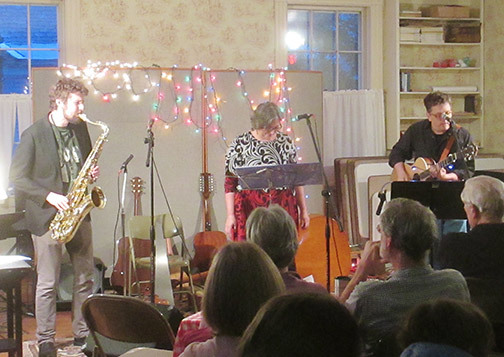 From left, Sean Kimble, James kitchen, Josh Wachtel, Heather Cupo, Kim Wachtel and Sarah Stockwell-Arthen.